Bounce criticisms holding back hip hop theatre? The prejudice I came across researching facts for the Insane In The Brain review saddened me, seeing how people can judge a book by its cover (or a play by it's poster), until I realised maybe it's not so bad! As my co-writer Archie once commented at a public hip hop event "the place is full of archetypal stereotypes who have no interest in what they're watching, only interested in being cultured and having an opinion on things." Unfortunately it's these archetypal stereotypes that are holding back hip hop theatre, as well as putting theatres like Sadler's Wells under (indirect) scrutiny for trying to push progressive dance forward. We're not all Diversity clones! @samranger Wait it is a "Live street DANCE version of One Flew Over The Cuckoo's Nest" title still: "Insane in the Brain". Still appalled. Good to see freedom of speech, of course, but shouldn't these people at least give it a chance before judging it? Hip hop shows that have made it to theatre land in London, Birmingham, Edinburgh, seem to induce headaches to couch critics, ie, the above Twitters, why can't they recognise that the top three shows we've had: Into The Hoods, Pied Piper (read review) and Insane In The Brain (read review) are all based on classical texts which their oh-so-educated selves probably studied at school? Boy Blue winning an Olivier Award for Pied Piper? The educated archetypal stereotype should be buying block bookings with an accreditation like that! As far as Twitter is concerned though, the meaningless ramblings of the 'ignorantly educated' shouldn't tarnish Insane In The Brain's reputation. Obviously I felt passionately that people shouldn't pre-judge something that even I hadn't seen before. That was until I realised they're the ones missing out! Insane In The Brain has been seen by over 100,000 people since it started in 2006. It goes without saying, that's a lot of people! And while I could worry about what a handful of people have to say about something they're too judgemental to see, it's me, not them, that's having a great night at the theatre while discovering another innovative twist on a classic tale. My advice to those that overlook street dance because they believe Diversity are a low standard example (and the Twitterers in question will be notified of this blog) is to go out and buy yourself tickets to any of the shows I mentioned above and let your hair down. Yes, I'm passionate about street dance, but do I jump to the same conclusion when I see a poster for ballet? No! In fact, I'm even toying with the idea of getting tickets to see Carlos Acosta in December! Open your eyes to other cultures around you, don't be so ignorant, guys! When the president of the United States calls you a jackass, you know you've messed up. This is presidential. 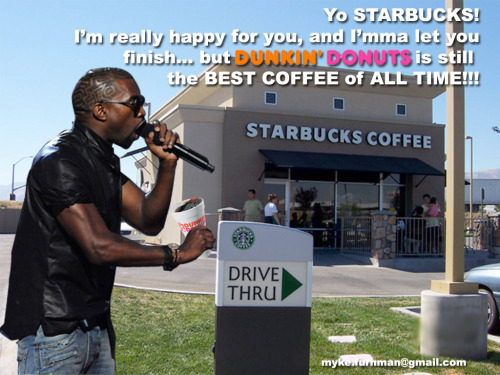 This is Kanyegate! So how Kanye must be feeling right now, I can't imagine! Since he jumped on stage at the VMAs to crash Taylor Swift's acceptance speech, fans and critics of the Louis Vuitton Don haven't reacted positively. But the blogosphere has had a fantastic time tearing into the incident! Minutes after he made his stance on who the deserved best video award should go to, Twitter was set alight with negative tweets about his speech-crashing behaviour, and now everyone is in on the act, with "Kanye West" being a trending topic for the past few days. @jwathen11280 "just heard that Kanye West plans on interrupting Patrick Swayze's funeral to inform everyone that Michael Jackson's funeral was better." @thelastshow "Kanye West is talented & his music deserves to be acknowledged with awards, but his bad behavior merits #BanKanye at awards shows for 1 year"
@mathis86 "just voted "Yes, hence the crop circles on his head." on "Is Kanye West an Alien?" vote too ➔ http://bit.ly/1xQZFw"
@smokeymtnpowder "Watching this kanye west video on youtube...he must be needing a paycheck pretty bad." Ouch. Guess people are poking fun quite a bit, right? Make the most of the satire while you can, people will get sick of it pretty soon! Happy Birthday to The Place! 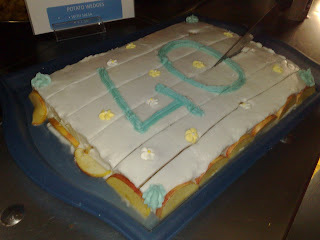 Happy 40th Birthday to The Place in Euston which is looking great for its age! In September 1969 Robin Howard founded the Dance centre in the converted Victorian drill hall for a season of works by the London Contemporary Dance Company. 40 years later, the dance styles, as well as the walls have expanded to accommodate different disciplines and continue to break down social, political and linguistic barriers. This weekend it opened its doors for people to come in and "taste" a selection of classes The Place has to offer for free. It was "Urban Flavour" day on Friday 11, with three specialist classes and three teachers: Lil Tim on behalf of Jonzi D Productions, Marso on behalf of Company Decalage and Jeffrey on behalf of Zoo Nation. The friendly staff greeted guests with a free 'goody bag' (it was all dance-related leaflets, but it came in a bag!) and some delicious looking home made jam for sale to raise funds. Then we were ushered to the studios for classes, which covered the basic skills in each of the disciplines, street dance and b-boying. The classes were just under an hour each, for beginners, but that didn't mean skill wasn't needed! Marso showed us the strings of a toprock to footwork routine, while the Zoo Nation class was a stylised street routine, vibing to an R'n'B track. It was pleasing to see that at least (I forgot to count) 6 eight-phrases were taught in the hour as well! Lil Tim taught several basic toprocks to footwork, and in true b-boy style finished off with an open circle for freestyling, where even the less confident dancers had a go. 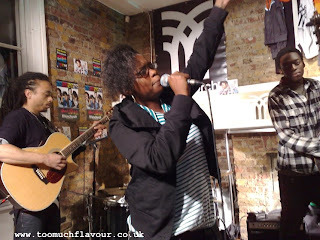 Nevertheless, a defiant Jonzi took hold of the microphone and said "Let's make this our party then!" leaving it up to the older dancers to take to the open circle, before jumping in and dancing to Chaka Khan's I Feel For You. Even a hyped up freestyle circle couldn't keep the after party going on for too long though, so the after calling it a night, the Place staff invited everyone into the bar for drinks where a Latino band were playing salsa music. During the interval in the band's set, a calorific birthday cake was cut into generous slices for all in attendance. Even though it was a Friday night, even journalists need to get home, so we took a share of cake for the journey and headed off. Many happy returns to The Place. It's looking great at 40, and we want to raise our glass to another 40 years of dancing! What with all the updates this week, I know this one is a little late, but I feel it's still worth checking out. A while back I headed to Brick City Boutique at the Elbow Room in Islington to check out the battles going down, and met a lot of cool people. On of them was a guy called Vice. Vice runs Street Soul Productions, which plays nothing but underground, authentic hip hop. Vice hosts his own podcast show. He caught up with me, as well as a few of the other people attending BCB, one of them being the legendary Skinnyman, to interview us for the Brick City podcast episode. You can listen to the podcast by clicking the link below, and if you like what you hear, make sure to subscribe for future podcasts. To give you something to BOUNCE about (sorry about the puns, I'll stop!) and to celebrate the return of the hip hop take on "One Flew Over The Cuckoo's Nest," go check out our feature on the main site. You may also go crazy (sorry, I said I'd stop) about the competition we're running. Sign yourself up to the mailing list and we'll enter you in to a draw to win a signed Bounce "Insane In The Brain" poster. You're a 'fan' of TooMuchFlavour because you're into some sort of urban lifestyle, but how many of you have yet to try actually giving dancing a go? Lil Tim, representing Jonzi D Productions, Marso, representing Company Decolage, and Zoo Nation will be giving FREE workshops this Friday at The Place, Euston. FREE! So whether it's your first time trying dance, or you're just brushing up on your basics, check it out. Read our article for more info and why we're excited about it! 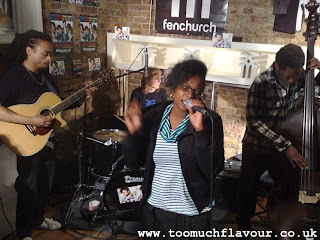 When I heard Fenchurch were hosting a live session with Speech Debelle at their flagship store at Seven Dials, there was no question as to whether it was worth checking out. I had to go. 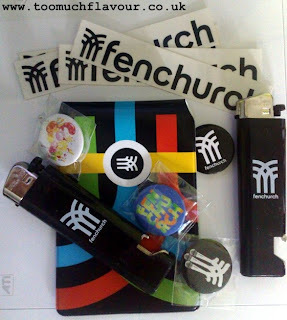 Fenchurch + hip hop! Speech is a Mercury Award nominee who is beginning to make a name for herself in the UK hip hop music scene for her softly spoken voice, honest and poetic lyrics and feel good live beats - she performs with an acoustic guitarist, drummer and bass player. It's like hip hop crossed over with a jazz band, a female Abstract to an English Tribe Called Quest! Fans will be waiting with baited ears for whether she's won on Tuesday, but to keep them excited she performed a few numbers off her album at Fenchurch as an intimate warm up gig before the winner is announced. Free drinks were available for attendees, as well as plenty of cool freebies to grab (not sure what was more popular, the free alcohol or the Fenchurch branded lighters!). It was warm inside the shop, which had all its interior shifted to make room for the band setup and the radiant lighting setup. People packed around in a circle, to which Speech remarked "Why are you in a circle?" making us spread the shape so everyone could see. The performance started early and the filled room with the introduction of Searching. When she finished, everyone clapped, only for us to find out it was the sound check! Ha! A few drinks later, if you were able to get any, the show kicked off at its correct time, now with slightly clearer acoustics. Like any true artist should for their fans, Speech performed a good few tracks (no 'two songs and we're done' stylee), including her latest single Spinning, Better Days and Badman. Speech's performance style is unlike typical 'hip hop.' No jumping up and down, amping of the crowd, but a lot of introverted, personal moments (albeit in front of an audience) while performing. While she spits her lyrics she looks at the floor a lot as though she's thinking about every lyric she's saying, a huge contrast between the showmen you see trying to whip the crowd into a frenzy. Instead it was like sharing her inner thoughts with the people in the room set to melodic and upbeat tunes. Maybe it's the current attention she's getting, I don't know Speech's performance history. Frequently she'd make the occasional well received joke though, and it was like watching someone happy to be where she is, doing what she likes doing, and that's performing. Her band should also be credited too, those guys know how to make a live jam sound good. This was a different kind of vibe, a rarity these days in hip hop, and it's good to see humble performers. The audience loved the performances, as did I. As did some of Speech's friends that turned up to show their support too! I'd only heard Searching - Amazon did a free [legal] download of it on promotion, and another song I never caught the name of, this opened my eyes and ears. Yes, the newspapers are making a deal about her because her style crosses over into what could be considered an easy listening market, but at least seeing her perform live (and in full) I now know what the deal is about, and it's made my mind up about buying the album too. Click below to listen to samples from Speech Therapy, and if you like it, buy it and show support! Something about the setup at Fenchurch reminded me of when King Apparel opened their shop doors to Guru. But there was no rivalry between the two shops (situated next to each other), in fact, King Apparel staff were also in the building. Hip hop love! 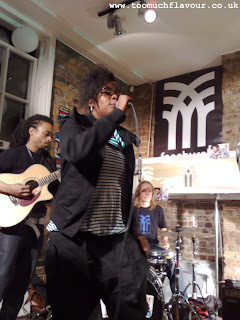 You can visit Speech Debelle's website at www.speechdebelle.com for more info on her, as well as links to her Facebook and MySpace. Last week we said we were excited about Dance Mob at the Southbank Centre. The aim was to learn a simple routine and perform it on a mass scale either stood up or sat down. With the good weather on their side (a rarity for outdoor occasions in England) people of all ages from the furthest reaches of London town came down to enjoy it, the Southbank awash with Big Dance Drop t-shirts. We'll kick ourselves for not getting out and enjoying too! Check out the video below to watch the large scale the routine was performed on. Feel good stuff! We reviewed "Get It On The Floor" at Hackney Empire and caught up with the group they say is the future UK Krump for a quick video. Go check it out on the site now! The video is pure joke!